A trip to Eastern Europe to see the Baltic States and Poland - why not? It all went down while we were sitting around a table eating some crab legs our good friends Mr. Matthew Paul Tubinis, Kristina Tubinis, and the infamous Ryan Bell. The Tubinis' started discussing a future trip they were planning to visit Lithuania. Lithuania? We were interested in hearing more about why they would want to visit this particular part of the world we knew so little about, but our ears perked up when they said, "It sure would be great if someone would go with us." Now, sometimes people say things like that to be nice and they do not actually want anyone to crash a trip they are going on to another country. I believe Sarah's response was, "Don't say you want someone to go unless you really do because we might just take you up on it." 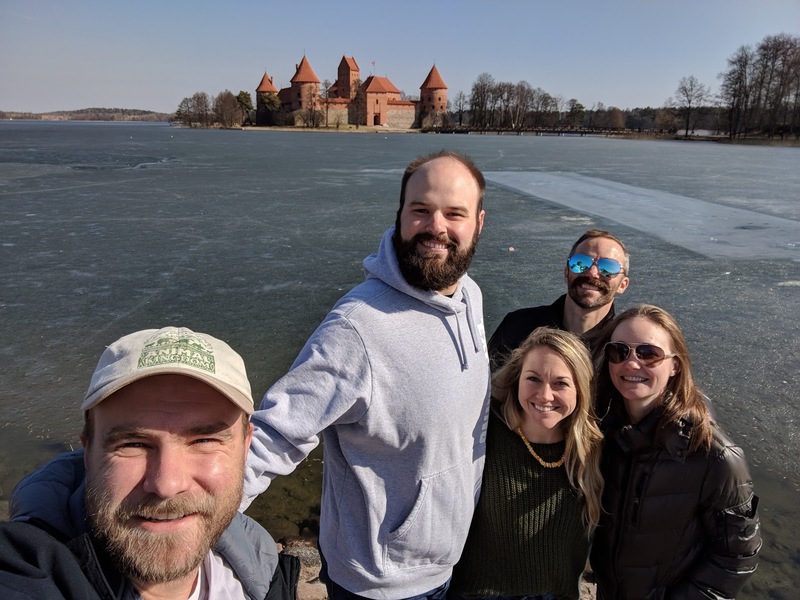 Well the conversation spun on from there and about five minutes later even Ryan Bell was professing a desire to head over to the Baltic states on an adventure of some kind. 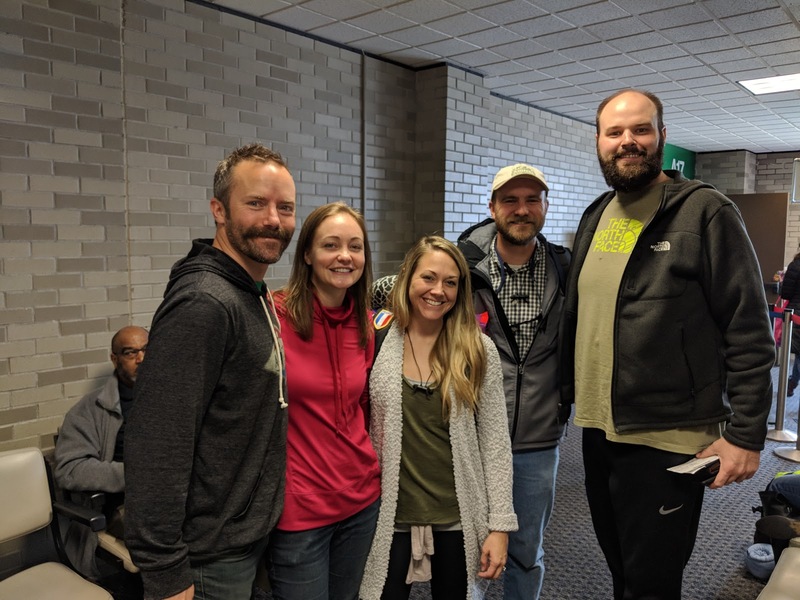 Five of us traveling into the unknown, what were the odds a trip like this would ever actually leave the ground? Highly unlikely. Disclaimer: These pictures are going to be all out of sorts and in no specific order. Some were taken by various members of our group, some by a camera set on a timer, and some by strangers. If you have any questions about a specific one, such as where it might have been taken, please just send me a message. For the sake of time and not messing up the format of the post, I am not going to comment on the photos. Please feel free to ask anything about them. The pictures will be of places, FOOD (because that's one of the main reasons to travel), of ourselves, and some of the folks we met along the way. So off we flew in pursuit of an adventure that was sure to toss some curve balls at us. We had one traveler (you guess) who had never traveled internationally. We had not a single person in our group who had ever driven or had any RV experience previous to this trip. No one in our group knew an abundance about any of these countries, though we were learning as much as possible for sure. But what we did have plenty of was positive attitudes and excitement about the trip! That's what it's all about anyway right? And to be fair, as Sarah and I have traveled around the world we have found that we can be content in almost any setting as long as our minds are focused properly. This is not always the easiest of tasks but it is certainly a primary one if anyone wants to enjoy traveling. For this trip for instance, it would have been silly not to consider ahead of time what it might be like to travel in an RV for eight days with five people. 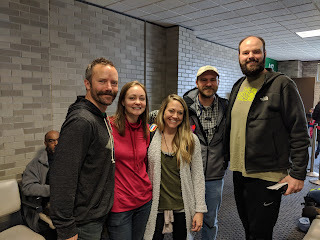 I would say our group successfully inhabited such a small space with flying colors, though much of this is due to a group of amazing people who are quite considerate of those they travel with. I cannot imagine the same situation with a self-absorbed wild person. Let's just not think of such things. Our trip began in Tallinn, Estonia. 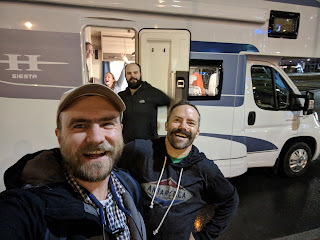 We flew in and made our way over to the RV rental place where we were required, rightly so, to watch a nice hour long safety video about traversing around in a vehicle of that size and its orientation. The company we used was helpful and set us on our way with a nice sense of RV driving understanding. As it turns out these short explanations were not quite enough to prepare us entirely for our RVing, but they were a good start. We are getting ahead of ourselves. The plan. Stay our first night near the airport and then get in the RV and work our way down to Vilnius, Lithuania (roughly six hours or so on the digital map). We learned a few things that first night. Number one, just because you plug your RV's electric chord into an outlet designed to give you power for the night does not mean you are actually receiving any power. Not to worry as our propane option kept us warm (it was pretty darn cold up in Estonia). We did discern from trial and error how to figure out if the darn chord was delivering power as we went along through our trip, but on that first night we were clueless newbs. We also had a crash course in the various types of RV parks we would meet along the way. We were about one month early for the tourist season of these countries, which means some of these parks are not open or various amounts of their amenities are not yet working (such as water, etc). 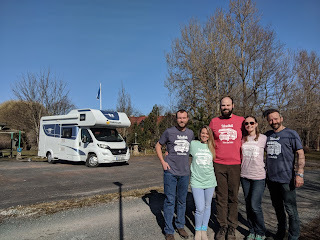 This brings about a few various challenges, such as where one should deposit the waste from the toilet when it is beginning to get full, but for the most part we were able to learn the RV ways. We made it through the night and the drive South began. Vilnius is quite a fascinating city. Ok, really every city we visited was great. The drive down to Vilnius showed us the countryside of Estonia, Latvia, and then Lithuania. 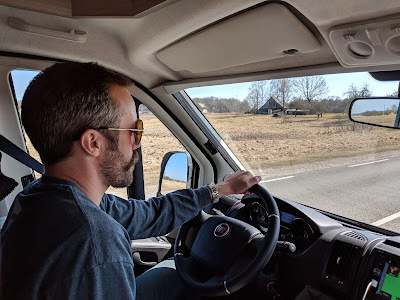 We drove through some wonderful forests, wove along the Baltic Sea coastline for a short time, and were able to get a concept of rural life in that part of the world. Vilnius greeted us with wonderful restaurants, beautiful city squares with lots of people and interesting architecture to watch, and it was not too difficult to even find a good parking spot for our tiny RV. This picture of Sarah and me is actually one that is matching up with the post. 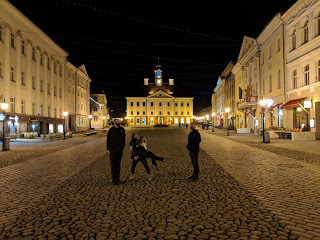 We are standing in a square in Vilnius not far from where we spent a good few hours in a delicious restaurant. 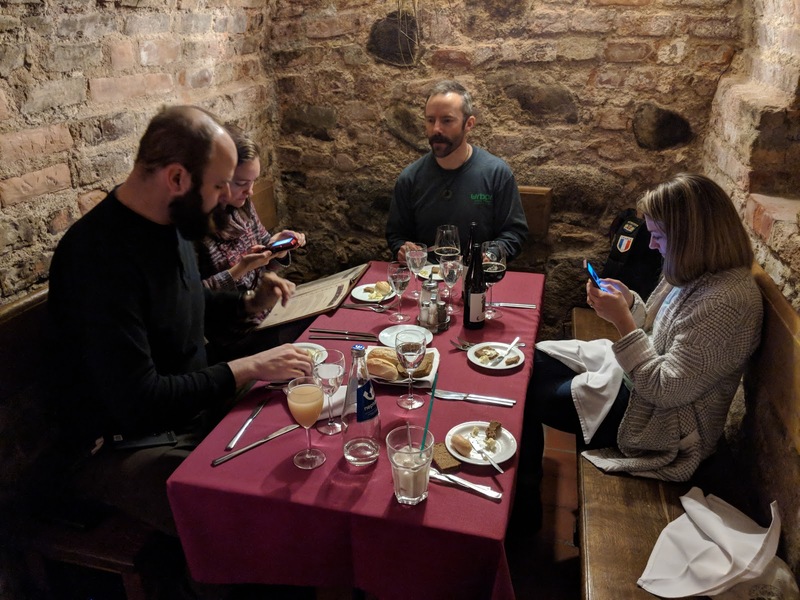 This is as good a time as any to mention we owe a huge debt to the Tubinis' for their extensive research they did before we headed (and even during the trip on their phones) over for our trip. 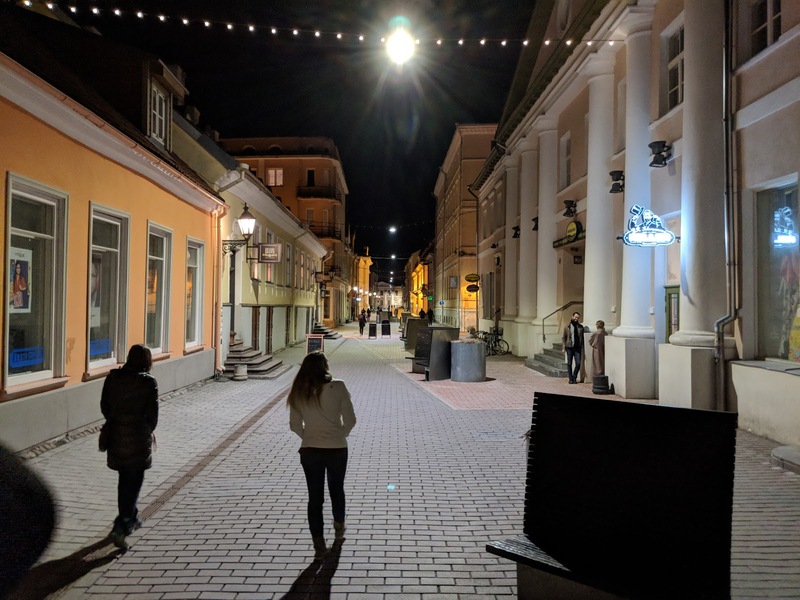 Vilnius was a great example of a perfect night thanks to the planning they had done ahead of time to weed out where we wanted to eat and explore. What a great night. We finished up in town and then headed off to our campsite for the night, which was arguably the best one we stayed at during our entire trip - and yes you could see a castle from it! 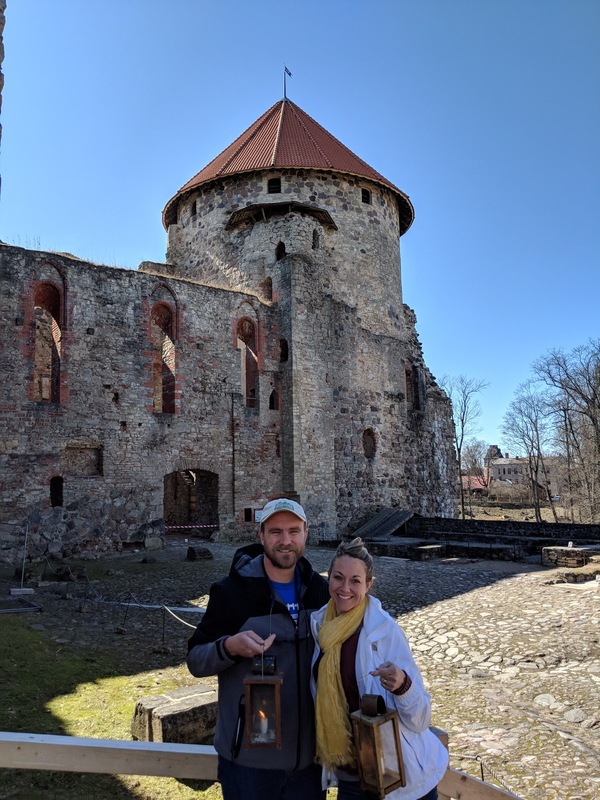 Not too far out of Vilnius is a spectacular castle that has been restored and welcomes tourists to come and experience a forgotten way of life. This was my one morning of personal success for the trip. One of my sub goals while traveling is always to get as many runs in as I can. While this is one of my favorite ways to see new places, it rarely happens due to tiredness from traveling and such. This morning, however, I woke up early and ran over to the castle, enjoying a wonderfully perfect day for a good run. How many times have I been able to run to and around a castle? I think this was my first. 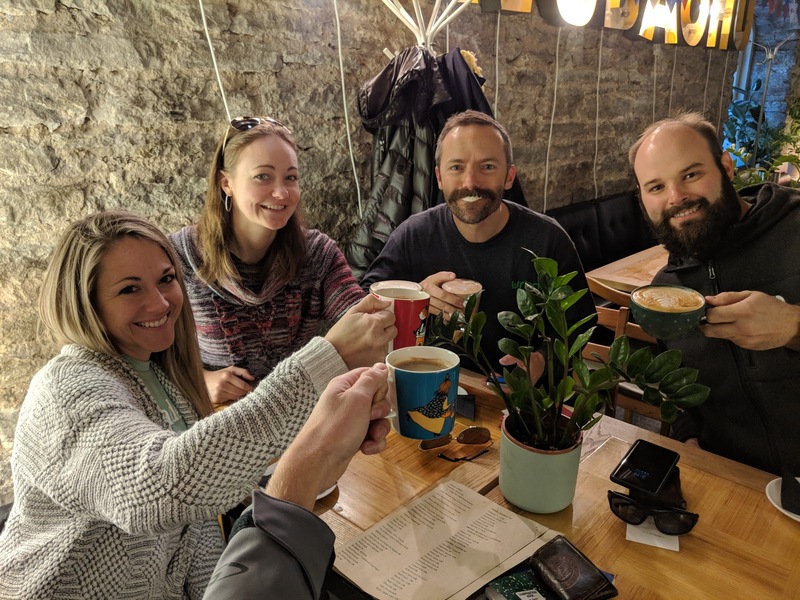 When I got back from the run we drank some coffee, made in our fancy coffee maker in the RV, and then we prepared to go investigate the castle. Quite a trip. 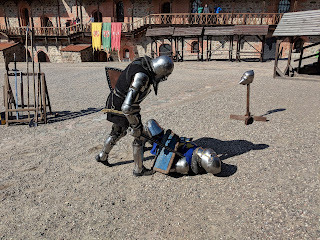 This included watching some guys dressed up as knights fight one another, walking through most of a completely restored castle with plenty of artifacts to learn about, and posing for plenty of great self-portraits like this one! Afterwards we stopped off at a nice lunch spot that someone in our crew, most likely one of the Tubinis' had researched, and had some traditional Lithuanian food. Thinking about it is making me hungry so no more comments on how good it was. 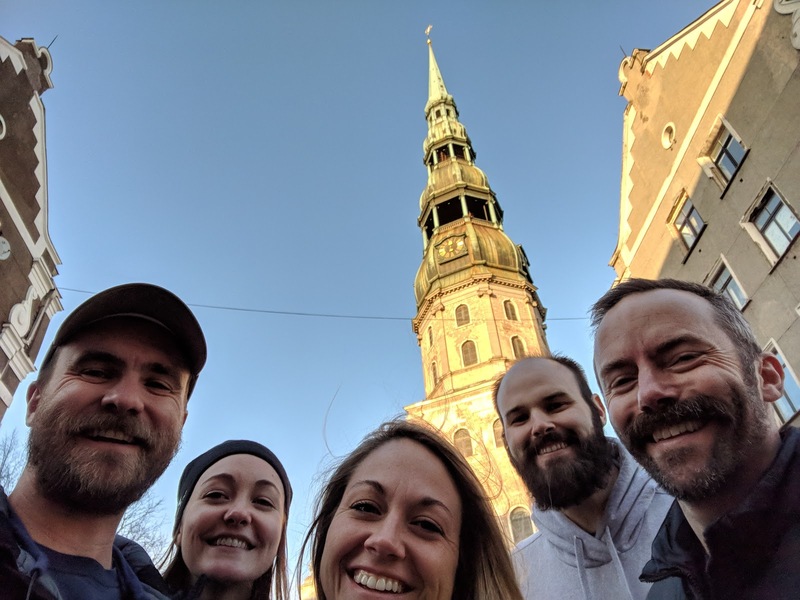 After finishing a super tasty lunch (dang it, I'm talking about it again), we began to work our way down towards Poland to appease some goals of our entirely too tall Ryan Bell. Yes, somehow he did manage to enjoy life in the RV, though he did opt out of trying to use the tiny shower and instead would utilize the amenities at the parks. The drive to Poland was very nice and gave way to extensive forests of evergreens. Peering into them as we drove by would lead the imagination into thinking of the many quests to be had by venturing off into the nearly pitch black paths between the trees only twenty feet in or so. I really enjoyed this part of the drive. Poland was the only border crossing that seemed to mind our RV freely roaming all over this small section of Eastern Europe. They stopped us and asked us a few questions like where we were going. This one turned out to be the hardest question to answer as we could not pronounce the name of the town in a way that he could understand. When we showed him on a map he immediately recognized the town and pronounced it entirely different from what it looked like to us. Dilemma resolved, passports all recorded, and after a nice "good luck" from our border patrol guard that made me feel a little uneasy, we were off and into Poland. This part of our trip was probably our least planned as it was a late edition. That does not mean it was not fun by a longshot. We made our way into Augustow and began to look around to see what a town in Poland has to offer. More good food, more wonderful churches, friendly people, a nice river to walk down, a few libations because one has to try the local options, some parks to explore, and of course a really fantastic cemetery that we ended up exploring at night due to the countless candles on the graves - really a site to see. There was no RV park open that we could find at the time, so we ended up finding a parking lot that looked relatively inviting. As it turns out we were not the only ones who had this idea and we shared the lot with another camper van. RV life! We played some card games, took a tour through the cemetery (night walk is the best), played some more cards, and went to sleep hoping no one would come and tell us to move. All good. In the morning we started making our way back into Lithuania along a different route with one goal in mind - making it to Aldona's place. She is famous in Lithuania for a home brew she makes. She would most likely be famous worldwide, but she does not use the preservatives necessary to ship outside of a small region even within her own country. Suffice it to say, we had caught wind of her operation through some of our extensive research and we really wanted to test out her product. This led us on a little bit of a wild goose chase as we only had her general neighborhood for an address. She brews out of a converted barn/garage behind her house and it is smack dab in the middle of a regular neighborhood. After a few failed attempts to locate her exact house we regrouped and headed to a local gas station for some advice. We left with a hand drawn map, renewed strength, and hope filled optimism. Though we took our directions exactly as given, we still ended up one street early and at a house that belonged to a very nice Lithuanian lady, but the wrong Lithuanian lady. We finally broke through the language barriers with the help of Google translate. We were only one road away! But through this whole process we had blown right past her hour and were now about forty minutes past her closing time. We made the quick adjustment in our location and found her house. We walked up her drive and found the right spot. Aldona stuck her head out of her back door and had the look on her face like anyone who suddenly discovers a bunch of foreigners walking around their courtyard - skeptical and questioning. Again, Google translate comes to the rescue and we eventually were able to explain to her why we were there and how excited we were to taste some of her home made recipe. Very generously she opened the doors to her backyard operation and led us upstairs to a room perfect for a gathering of fifteen people or less. I loved the atmosphere in this room. It had pictures of Aldona's travels around the world, awards that she had won for her beer making, skulls from small antelope looking animals, old barrels, and a nice farmhouse type of feel. She brought in a few samples for us to test out and she disappeared. Time felt slightly strained as we were already there after hours. Should we wait? Was she coming back or waiting for us downstairs to leave? We finally decided, after much debate, to head down and try to figure out how to pay her and thank her. I was the first one to walk out and stopped dead in my tracks as I looked up and saw Aldona coming towards me carrying a big tray of cheeses. I motioned back up and she nodded with a big smile. We could not believe we almost left! 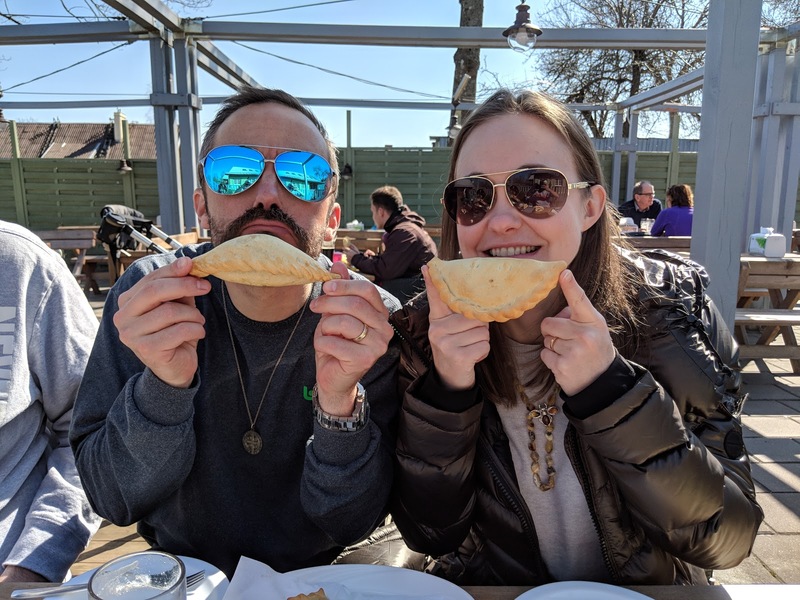 The next hour was magical as we tasted a few more brews, chatted with Aldona (again through the help of modern technology), laughed and made jokes together, and ate some of the most delicious cheese I can remember eating. Cheese and beer - who knew? By the time we left Sarah and convinced Aldona to sell her a small barrel she had been using to pour us some beer, and everyone was so happy to have experienced such a truly authentic Lithuania blessing. She did not need to open up for us or go way out of her way to be so hospitable, yet she did. This one event, for many reasons, was voted the most memorable part of our trip by more than one member of our crew. For this reason, and because I love the photo, I put the picture of Sarah and Aldona enlarged. What a perfect photo to describe our experience there. Having thoroughly enjoyed Aldona's homebrew, we then started making our way towards Latvia. It was time to experience the country we had only driven through on our way to Vilnius. There were of course countless stops along the way I am not mentioning, whether through neglect or absent-mindedness or even apathy, but not to worry as most highlights will make their way into the post. 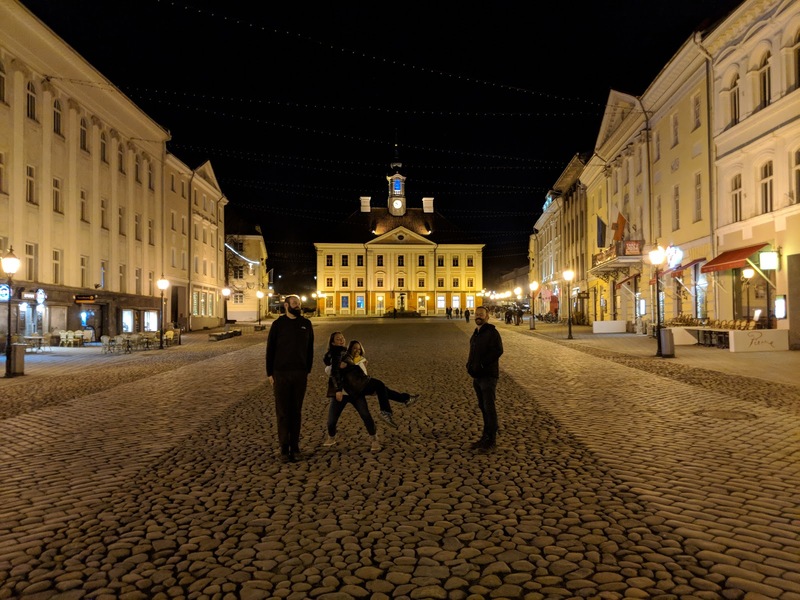 It was at this point our trip started detouring from some of the earliest made plans due to things like staying a night in Poland and making sure we went back past Aldona's place. Instead of heading towards the Southwest coast of the Baltic states along the sea, we made our way more directly towards Riga. Usually at this point someone in our group will say that's not what we did. They are probably correct, but this is how I remember it and how I'm reporting the facts. It is also at this point I realized I was missing a place or two. I will interject them here and hope it is correct chronologically, although who really cares? On the way to Riga we went to Kaunas for some lunch. This afforded us a nice stopping place for rest, food, and exploration. We did not spend much time there as we had goals to make it to a few other places along the way, including another castle. This castle was not completely rennovated like our last one, offering a more rugged sort of experience for a person to enjoy. 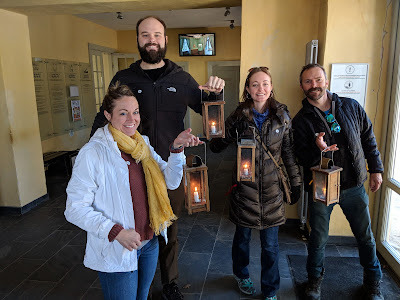 We were handed lanterns and told to have fun exploring the castle and to be aware of the very dark places we would be walking through. Awesome! And it was pretty darn cool. We walked through some ruins and wove our way to the back of the castle where we could wander down some steps and into a dark corridor. From there we used the light of our lanterns to guide us up a spiral staircase to other parts of the ruins. I personally thought this was a genuinely unique experience and enjoyed every minute of it. The self-guided tour took us through a few different rooms and overlooked the remnants of where the massive building used to stand. In Riga we spent time looking at ancient churches, walking past modern castles, working our way through crowded city streets to some shops, and eating more good food! This was a great stop and was also one of our better RV stops, in that there were some showers with good pressure which was super nice. We made it into town, found a spot for the RV on the street right in the middle of the city (which I'm still rather impressed with myself), and immediately walked to a lunch spot our team had scouted out. Delicious! I should take this time to mention I really like beets. Beets are a staple food of the Baltic states and in these pictures there will be more than one beet food depicted. 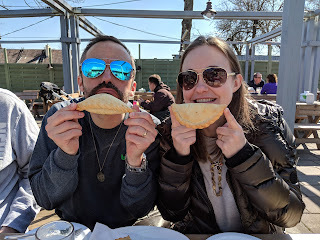 Great rye bread was also a nice treat we would get along the way and I believe Riga was one of the places where we had some for lunch. After shopping and parousing the city a little (with a quick run to drop our RV at the park for the night to make sure it would work and so that no one would have to worry about driving after dinner), we hunkered down for a few hours in a giant cellar for dinner. 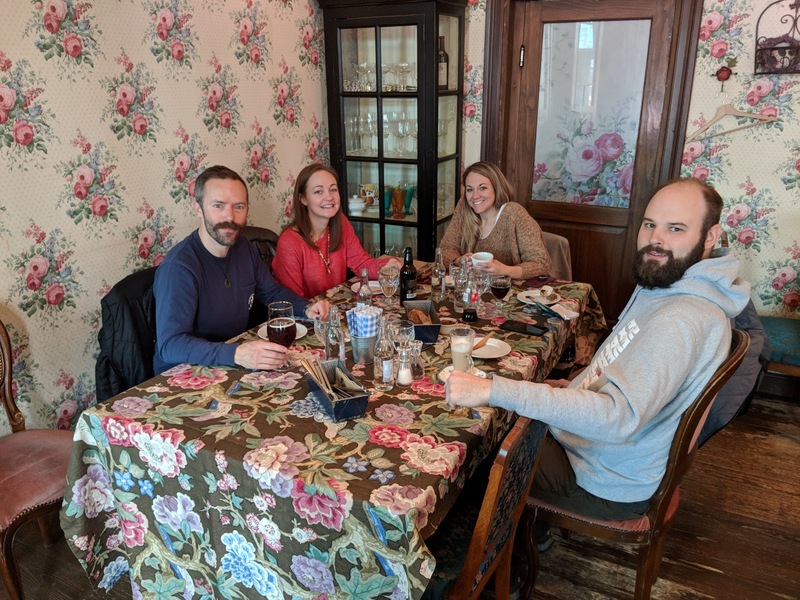 There was live music, good food, quite a lively atmosphere of young Latvians and others, and if you would like to know the names of these places you will need to ask Matt. I did a terrible job on this trip of keeping my notes up to date. We were there for quite some time working on some libations and a hefty meal. When we finished our meal we walked back through the night to our campsight, a close to two mile walk (which I think is great after a big meal), and played cards for a few hours. Ryan had introduced us to a game called Hi Low. It quickly became the dominate game of our late night RV times. In the morning we rose early, took advantage of those sweet showers, and then headed on our way towards Tartu, the intellectual powerhouse of the country. It was likened in one of the books we were using as the Oxford/Cambridge area of the Baltic states, or at least that country. I need to mention it was at this point in our trip when we decided we really needed to figure out one of the aspects of our RV life. There are four main factors: diesel (easy), water (not too bad, just got to find a spot that will give it to you), waste (not fun but also not bad as long as you find a place you can dump it), and gas (propane). This last one had become somewhat confusing for us. We had tried at a few gas stations to trade in our one empty tank (we had two cannisters) along the way, only to find out they did not deal in our kind (the propane, not us - at least we think that's what they meant). We remembered our guy saying we could trade it in at virutally any gas station, so we were surprised to find this to be difficult. Finally we called him and discovered it had to be a particular type of gas station that sold our kind of propane - boom, no longer a problem. To veteran RV people this must seem silly, but to us this was not self-explanatory. Anyway, once we figured out how to get more propane we could relax significantly knowing we would not freeze to death (or spend a super uncomfortable night) while we slept. This was good news! 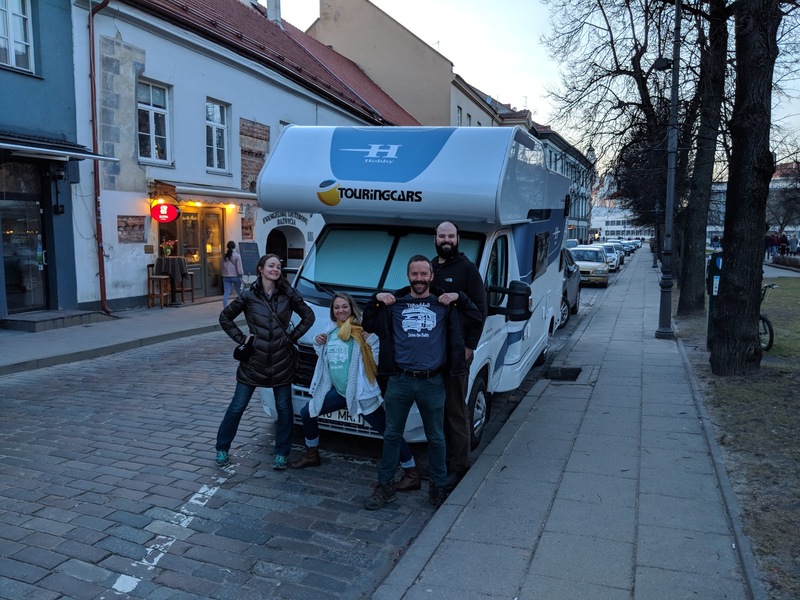 We arrived in Tartu, exchanged our propane, and then tried to park as close as we could to our desired destination for dinner. This led the driver (me) to breaking the first major traffic law (that I know of) during our trip. In seeking our destination I must have missed a sign because suddenly I realized we were driving through what had to be the local town square. When I mentioned we might be in the wrong spot, our crew began looking out of windows only to confirm there were many snickering university students looking at the giant RV driving where it should not be. Fortunately I rectified the situation as quickly as I could and we were back on normal streets again. Phew, and no police came and got us (even bigger phew). Tartu was more of an evening adventure. We arrived to town a few hours before sunrise and then wasted a little bit of time as we replaced our propane. Once we were done with yet another delicious meal, we walked through the university town admiring the buildings and talking for a few hours. At one point we walked into a building that happened to be open and Sarah disappeared up a stairwell in discovery mode. It was rather dark and we no longer had our lanterns from the castle. I was relieved when I followed and found her at a locked door with a diappointed look on her face. Sometimes that girl sure does like to go wandering off no matter the situation, usually with a comment like, "It's fine." 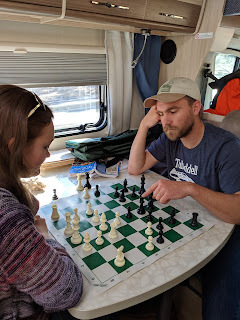 We finished up our walking, we played some cards, and then slept the night in the RV in a parking spot alongside a city park (kind of our signature move when we could not find or did not want to find a proper RV park). Random RV story: One of these nights, perhaps it was this one, I heard Kristina going to the bathroom and thought someone had broken into the RV. I was still in sleep mode and somehow leapt from the top bunk I was sleeping in onto the floor. Loud crash. A few questions. Um, I am not quite sure. I guess it's good to know I was ready. Then I had strange dreams for a night or two. RV life. I believe this brings us to the end of our trip. We headed from Tartu up to Tallinn so we could get a day and night there. 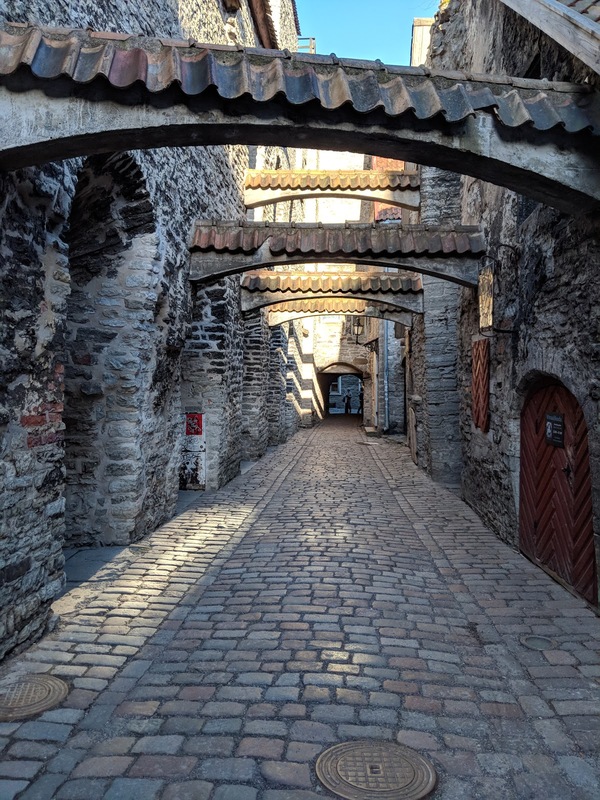 Tallinn is quite special. It used to be a completely walled in city. Over time they have taken down walls, for things like traffic and such, but many of the walls are still intact and/or are being restored. The city really does have a unique feel to it and we just loved it. Sarah, Ryan, and I were able to spend a little bit of time there on our first day while we waited for the Tubinis duo to arrive on their flight (and they consequently had an extra day when we left), and we enjoyed being able to get some more time there. It seems redundant at this point to even mention food, but Tallinn does not disappoint in this department. I do not think there was a single moment during our trip where I thought, "You know, this food is just not good." I loved it all. Our lunch spot for the day was in a place that was called either Mothers or Grandmothers (something like that), and they had pictures of the original cook who had come up with the recipes we were eating. Quite tasty and fun. One of the things I had read about Tallinn in our research are the tours they do in tunnels under the city through passageways that were originally created for purposes such as moving troops around in a way that armies outside the walls cannot observe. Over time the tunnels have been used for various purposes, some of the passage ways even being forgotten or unused for many years, and now portions of them have been reopened for a few different reasons. We took a tour of these tunnels and wound underneath the streets of Tallinn learning of how they have been used in more recent years - as air raid shelters, by the homeless and teenagers, and other various purposes. It was interesting but I thought the tour included walking up onto the parapets and the walls some. It did not. I did not read the fine print on the tour. Oh well. It was a neat experience and it ended with what has become an underground art museum of concrete work that used to adorn much of the city buildings. The setting was perfect for viewing this type of art and it was very appropriate. 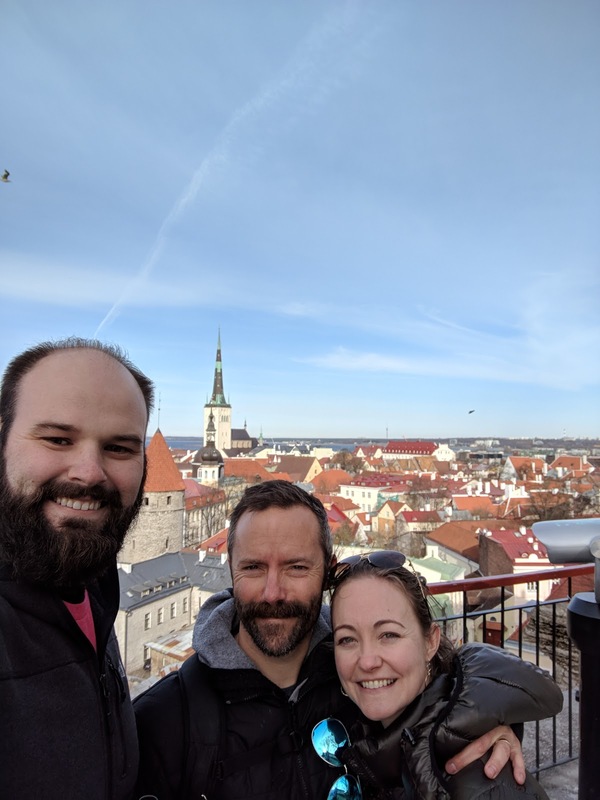 Our day in Tallinn included climbing to the top of one of their churches. This was pretty funny as visiting churches is pretty high on our list. We all are people of faith and love visiting various places of worship around the world. The funny (not that we like to visit churches) part was when Ryan noticed people high up on top of the church looking around the city. We walked in to investigate and discovered we were in for a nice climb - no elevator. Have I mentioned how tall Ryan is? 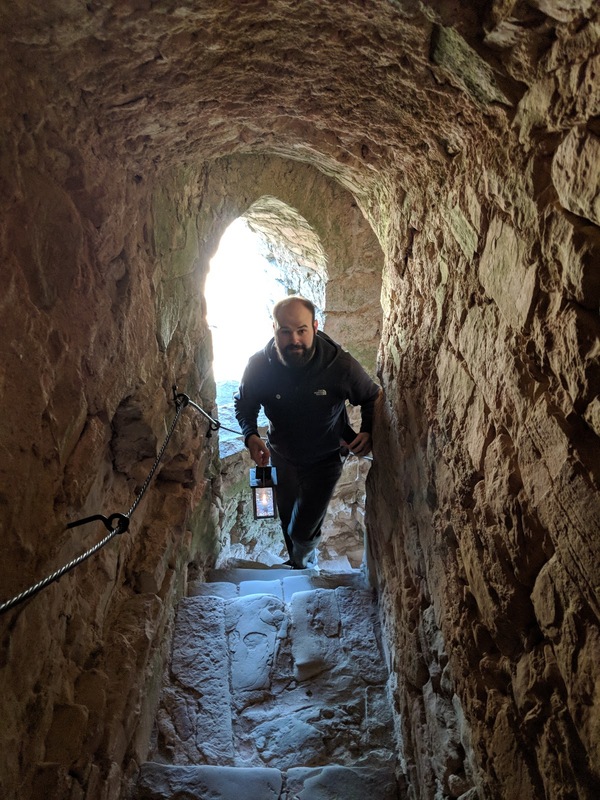 But we made it up and the view was well worth the effort of making it up through the winding stairway, which by the way felt and looked as though it was hundreds of years old (I think it was and just assumed it was tested by time and probably would not pick today to crumble). This was a constant topic of our group as we walked through cities that have been around way longer than the country we all call home. Very amazing to step into such ancient buildings. We enjoyed our view from the top of Tallinn's old city and then we made a much easier way down. Once down we continued to enjoy the city until we had to return to our RV park for the evening. We most likely would have stayed until the wee hours of the morning but we unfortunately had to be back to our park by a certain time for certain amenities like showers (it was strange that they did not stay open all hours like every other place we had stayed, and though it was super nice spot it was really bizarre at the same time). That did not stop us from getting some last minute shopping done, visiting a museum or two, sitting and enjoying some sun bathing (watching people) in their beautiful town square, and having yet another stellar dinner. Was our last night in the RV bittersweet? I would say yes, but all the cleaning and packing we had to do kept us from thinking of such things. We had to return that bad boy pretty much as we found it - pretty much. But it had been a reliable way to make our way through four different countries and it never let us down. I would definitely do the RV thing again, especially having learned a few things that would make doing it way easier. The shirts. 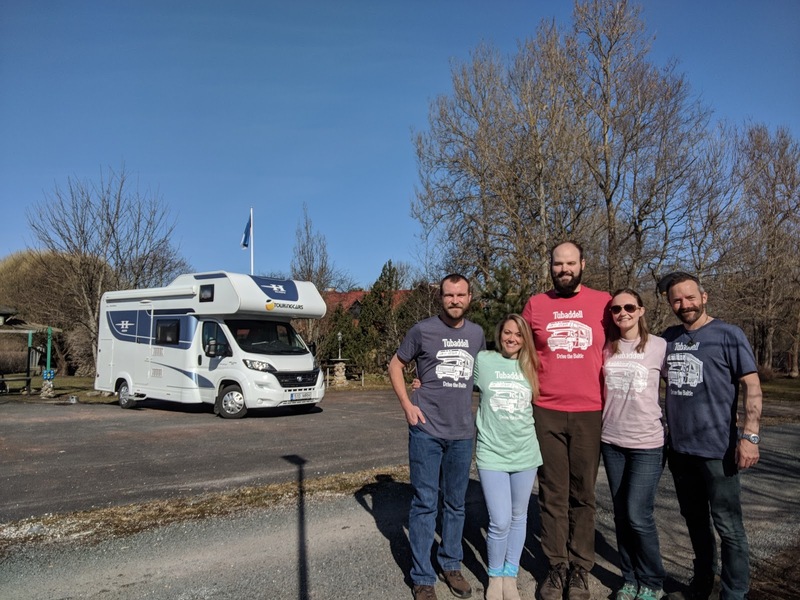 Our team shirt for the trip says "Tubaddell/Drive the Baltic". The drive the Baltic part is pretty self-explanatory. And if you've been paying attention the Tubaddell is too. Tubinis, Baddorf, and Bell... or Tubaddell. Nice right? I know, I have thought of just quitting any job I have ever had and going straight into the creative industry, but something always holds me back. One day though, and then it will all be gravy. Ok. Photos below because it's hard to write as much as there are amazing photos, and I really tried this time. Sorry about that, the too much writing part. Hopefully if it was too long you just skimmed and looked at the pretty people in the photos. Thanks for reading and as always happy travels. Maybe you should go check out the Baltic states. I will finish by saying we found roundtrip plane tickets for just over 700 dollars, which is amazing for such a far off destination. Think about it.